Setting up camp is easy as a breeze especially if you’re a frequent camper. You can probably set up your tent with one hand tied behind your back. While this could be true for some people, not all of us are experienced outdoors. 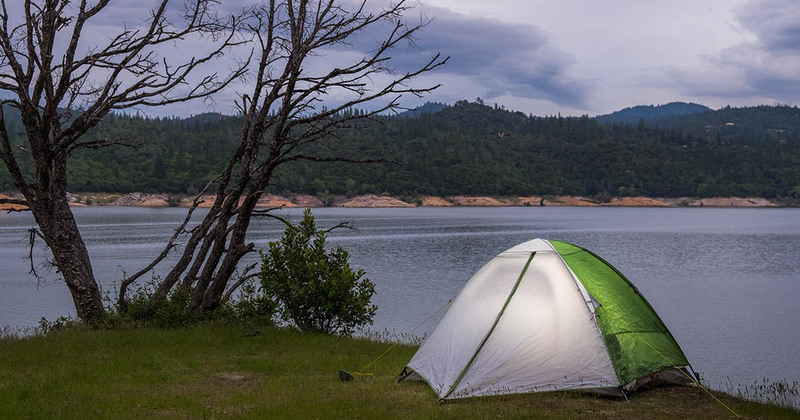 Here are some mistakes to avoid when setting up your tent. For some people, setting up tent means looking for even ground to make pitching easier. We look at the surrounding areas to ensure that we have enough space but rarely look up. There are many reasons why you should look up before setting up your tent. There might be beehives, spiders and other objects that could obstruct the height of your tent. The best reason to look up is the Widow Maker. It is a tree branch that is rotten, broken or hanging and is likely to fall. Spotting them is easy but you have to look up first. There are campers that die each year because a branch fell on them. This could have been avoided if they looked up first. One of the steps in pitching a tent is to stake it to the ground. However, not many people follow this step thinking that it is only used when the weather is windy. This is a common camping mistake because weather is unpredictable. Sometimes the smallest gush of wind is enough to topple your tent or send it flying away. If you have lost the stakes to your tent or if it is one of the models that doesn’t come with stakes you can buy tent stakes separately. Being aware of the sun can save your tent from becoming an outdoor oven. When you’re camping in the summer, setting up your tent in direct sunlight can make the temperature inside your tent very high. Not only do you want to know where the sun is, you also want to know where it hits your tent during certain times of the day. If you are going to be camping in a warm climate check out our post on hot weather camping gear. Sleeping on the ground can be very hard. A good tent and quality sleeping pad can help a lot. However, the quality of the ground also has a big impact on your comfort. Most people know that good ground means finding space that is free of rocks, debris, branches and roots. However, a good sleeping ground should also be high so that you don’t drown when it rains. Don’t make the mistake of setting up tent below a hill because debris can roll down or you can get flooded when it rains. Always look for high ground that is level and debris-free. It’s always a bad idea to arrive to the campsite late. Even if you’ve camped on the same spot for a long period of time, it is always better to arrive early. If you arrive late, you will be rushing to pitch the tent before it gets dark. Rushing results in more mistakes and will make you become frustrated. It can also be hard to find firewood, water and other things the as it gets darker. It can be hard to enjoy the outdoors when you don’t have shelter, warm fire or the comforts of home.